Oh, and the ‘men and bunkers’ riff was challenged by the audience – and a great discussion had around whether women and men equally attach to machines, objects, intimate spaces. Yes, they probably do. But we all agreed that conditioning plays a role too. Kitchen vs Shed does seem to have a gendering, and both can be domestic. Bennett, L. (2011). The Bunker: metaphor, materiality & management. Culture and Organization, 17 (2), 155-173. 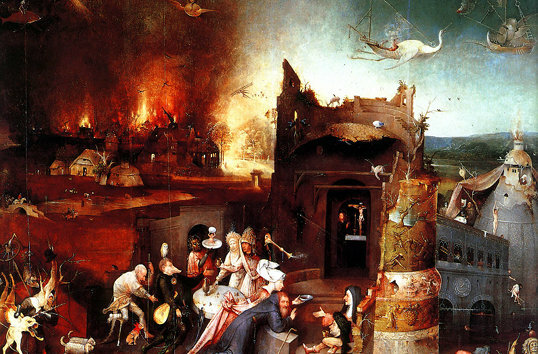 This is an alternate version of my jaunty and whimsical review posted today on the Occursus site. Insect Theatre violently drags the spectator into the tussocks. 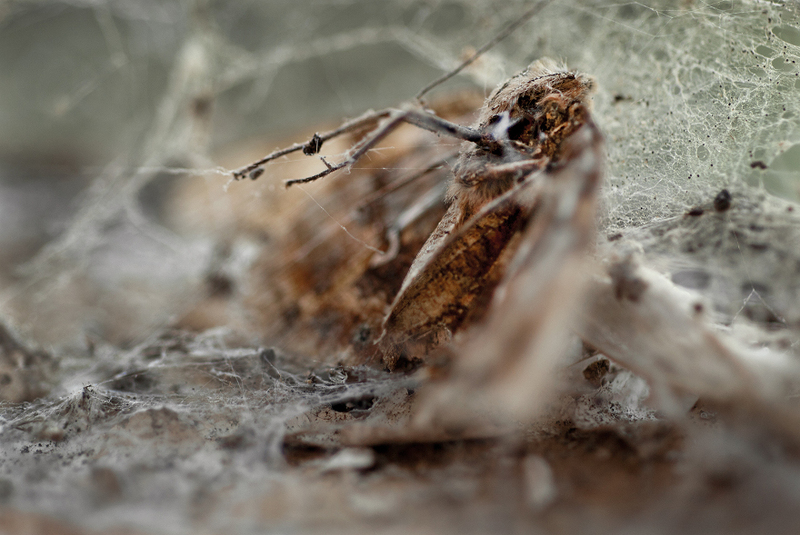 In Edgar’s close up images of dead flies, the spindle trails of spent spider webs and the death-field detritus of broken wings, legs and other shrivelled insect matter we journey into an unrelentingly Hobbesian state of nature, a world of devastation and desiccation-into-dust. Accompanied by four short essays by anthropologist Hugh Raffles, the book manages to achieve an even bleaker tone than Papadimitriou’s paragraph, and something even more sinister than Bataille’s meditation on dust. Here the air is chilled by Raffles opening depiction of the death throes of a fly as it surrenders “in muddled exhaustion”, stuck fast on a flypaper, and things get no warmer in the tone and staging of Edgar’s images, for even his colour images have a muted, decay ridden palette. The abject effect is also achieved by focussing exclusively upon dead insects – dead defeated insects. This book does not present a valedictory account of the heroic life of rampant creatures. The victors are not seen here. These scenes are aftermaths of insect wars, and only the victims are left on stage. This conjures a strange horror-absence effect , for the victorious protagonist is absent, the sensation of viewing these images is a bit like stumbling into a giant’s cave and its litter of strewn bones. Will the giant return and trap you as you gaze on at the remains of his last meal? Many of the images show conquering web, a shroud-like dirty gossamer tightly wrapping the trapped insect carcases. These death-bundles are attended by tendrils of filament striated across the frame, taught lines of ominous vibration-cord, still capable of signalling to the predator off-stage. Careful where you tread next, you might awaken the monster beyond the page. The viewer becomes uncomfortable partly because here is dirt as art, but also because of the scale effect of dragging the viewer into the scene. Edgar’s pictures shrink the viewer down to insect size. And strangely this is achieved through removal of human reference points. This isn’t a Honey I Shrunk the Kids world, where the insects are shown living in small corners of our world. No, the absence of such collateral renders this a more alien place, one that is terrifying (and perhaps beautiful in an odd way) in its own terms rather than through any clear association to a ‘background’ human world. More info at Black Dog’s site. This essay is about confined spaces that only reveal themselves to humans fleetingly (if at all). It is about the effect of noticing them and lingering to contemplate them. In spirit it follows in the footsteps of Gaston Bachelard’s meditations on the shelter-world of homes, shells and nests. But I will drift more towards man-made interstices, with the voids within walls, furniture and floors. Bachelard’s project was to enquire into the ways in which the creative unconscious and places of dwelling are linked in human minds and actions. I find myself drawn more towards the alienness of spaces that are non-human due to their size, location or other form of human inaccessibility. In what circumstances are these spaces noticed by us, and in what ways do we possess, know or colonise them? Watching an old sofa burn earlier this week, it was the moment that the fabric panel beneath the arm rest rolled back in the face of the flames that caught my eye. For, in that unfurling, the inside of the sofa arm revealed itself to me as a cavity, a small cavern bounded by a wooden framework, iron springs and matting; an unknown hollow that I had spent many hours resting against. This was a place that had not seen daylight since it was enclosed by the upholsterer many decades ago. But for a few moments fresh air was able to rush into this once enclosed territory, flames then quickly following in air’s invasive wake, briefly filling this void with overwhelming heat and light before bringing about the collapse of the framing tiers of this now failing structure, and the extinction of this space. This sofa’s fate was sealed by an incontinent cat. This furniture had to go, it couldn’t be passed on. So, it went by fire. During the life of this sofa this enclosed space was inhabited only by stale air, crumbs, dust mites, fleas (courtesy of our dog and cats) and perhaps holidaying viruses and bacteria migrating there from the surficial smear-strips of youthful residents or their guests. It was an alien ecology, a vibrant place (perhaps) for some life forms, but not a place of human habitation. It was, in human terms a ‘non-space’, a place beyond access, beyond the human everyday realm. I’d fleetingly glimpsed another world down the back of the sofa. We normally only venture inside our possessions when we are searching for something. A lost key causes us to explore coats, pockets and sofa crevices in a way quite out of keeping with our usual disregard for such locations. Briefly we pour over them intently, inspecting such cavities with unfamiliar intimacy, often with hesitancy. Contorted fingers venture tentatively beyond sight into foreign lands, fearing spiders, dirt or other unknowns. Then we withdraw once again from these spaces, they cannot be occupied permanently, the body and/or the mind could not stand it. To slide under a car or bed, to probe a sofa, cupboard or wall void, to climb into a wardrobe, attic or inspection chamber: all are challenging and thrilling, but they are temporary incursions. Daily human life could not be lived in these spaces. And yet, occasionally humans do in extremis seek to dwell in such places: priests, fugitives and other refugees have all sought out spaces to dwell within the hidden portions of houses. In such situations the acquaintance with those spaces would energise otherwise liminal space. In a feint echo of this perhaps, hiding as a child, striving to suppress the sound of breathing whilst squeezed into the wardrobe you became strangely aware of the nature and features of that furniture. The grain on the door, the smell of the place, the occupation of this space by other stuff stored there and the resistance to your weight as it creaked to accommodate its new exceptional loading. For a few moments you might have glimpsed the sentinel-like essence of what it must be like to be a wardrobe. But then you stepped back into the real world, stood up straight and got on with being a human. Clearly we can never actually come to know what it’s like to be a wardrobe, or even what it’s like to be a creature whose natural habitat is such spaces. 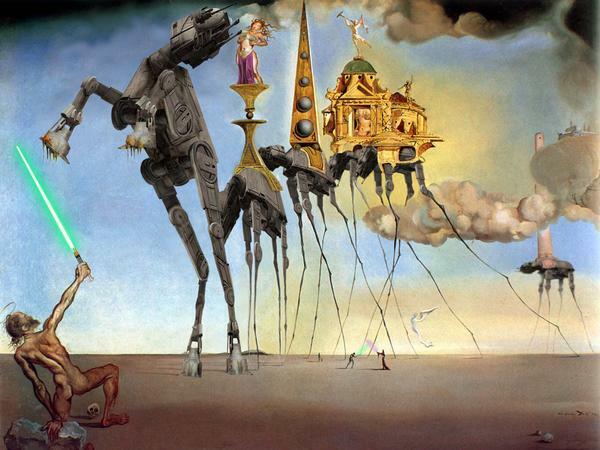 Yet fictions of miniaturisation, like The Borrowers, Mrs Pepperpot or Honey, I Shrunk the Kids embrace this alienness. The humans are for some reason shrunken, and find themselves exploring the familiar home-world in new ways. Everyday objects become functionally mutated. A shoe becomes a house or a boat, a puddle a lake. As a room becomes a continent, an alien landscape is glimpsed in all its now-apparent jeopardy. And then a full-size human appears and the mini-people have to flee the ‘giant’s’ footsteps, as that giant goes about his everyday engagement with mundane spaces and things. If the mini-people are lucky they will manage to reach the relative safety of a mouse-hole, and will enter the wall cavity. These mini-people get to go where the full size humans cannot. To explore floor voids, cavity walls, rafters – to see a house from the truly-inside, to scurry sideways through a house like a mouse or a spider. I’m jealous. The closest I’ve come is in a videogame adaptation of Disney’s Ratatouille film, in which players get to venture, like a rodent Laura Croft amidst the cavity wall of a Parisian town house. To see the wall from the inside is to see the way that plaster oozes there in sensuous bulges through the lath strips. On the outside the plaster is all smooth and neat, but on the inside it is the epitome of disorder, irregularity and an excess of matter. The quest for epic smoothness on the exterior, requires this secret opposite effect inside the wall. There is something Dorian Gray-like in the banishment of imperfection from one zone into another. But this by-product effect isn’t meant to be seen by the human eye. And yet the invisble stuff seems important, or at least it does to me. I recall a recent work meeting. A gathering to view a nearly complete 3D virtual reality model of a house, designed for building surveying students to practice upon. 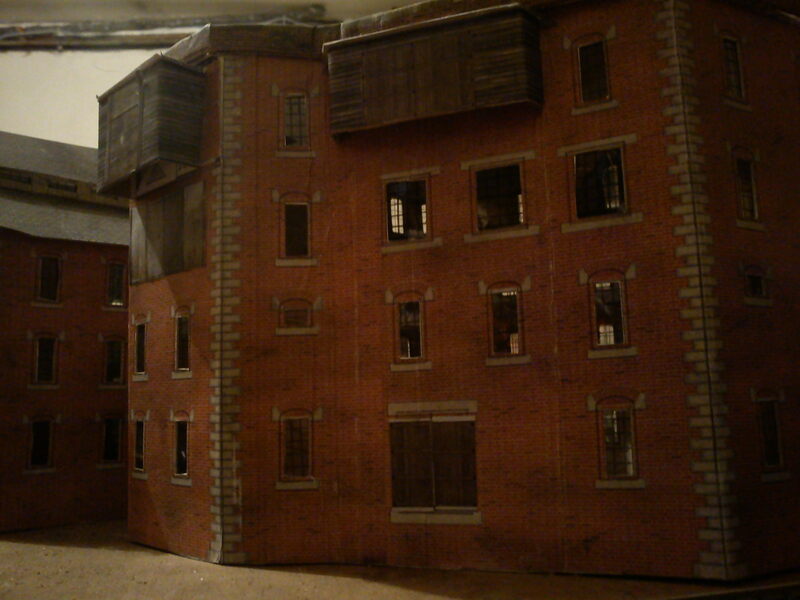 During the meeting the presenter was keen to assure his audience that this simulation was a replica of a real house, and that the design of the model was one strictly shaped by adherence to ‘real world physics’ (which meant the students could not levitate, walk through walls or otherwise use super powers in their engagement with this place). But it was an abrogation of real world matter-detail that irked me. I asked whether it would be possible to lift up the floorboards, to search for the wiring, to observe the runs of the central heating system or the remnant traces of the gas lamp piping. ‘Um, no’ came the reply, ‘building surveyors don’t report on those systems’. So, that aspect of detail would be ignored, partly because in disciplinary terms it was considered irrelevant and partly because of the vast coding and data resource that would be entailed in depicting hidden features of the house that might never actually be searched for. At the level of logic I understood, but at gut level this felt like a serious dent in the authenticity of this depiction of the house. Like an obsessive dolls house maker I felt the need to paint walls it would not be possible to see, to fully populate this model. To strive to include everything, even the invisble stuff. Eventually, a concession was offered. A few bounded zones of subsurface detail could be added, places where the students could chase out mold, damp or other building pathologies. Students would there have the equivalent of ‘dig here’ prompts, and could mine at those locations into the ‘relevant’ interior detail. This was a token nod to the invisible realm, but better than leaving the invisible entirely unrepresented. But Bachelard seems to be conflating two different drives here, and neither is what I feel. In Bachelard’s quote there is a concern with escape from the house, and with colonisation beyond its borders. But what drives me to pull up floorboards, or to look in the wardrobe, each so that I can sleep better at night is a desire to fully know the house that I’m in. I don’t want to escape or to invade next door. I just want to be fully connecting to my own home. I’ve come to realise that there is something ritual in my floorboard-thing, and yet I usually end up looking into floors or walls for pragmatic DIY reasons. The soul-resting bit usually comes as an afterthought, a realisation that I know have made peace with an otherwise alien void space. It has become known, claimed. It is part now of my home, rather than a brooding alien presence within the fabric of my house. Yet this resulting purging effect does have a feel of solving (or at least salving) a haunting. I’d imagine that those who may have experienced an actual infestation – a wasp nest or some other living, breathing and breeding alien presence within their home – would have that sense of release in even greater measure. The antagonistic pest co-resident banished at last from somewhere within the recesses of the home, must make the home feel fully known and possessed. And perhaps to get rid of that alien presence a specialist was procured. Someone well versed in inspecting, reading and probing these non-human voids. Someone who knows the ways of these spaces, understands their ecology and/or the infrastructure that passes quietly through them. The humble pest exterminator, plumber or electrician is not so humble when viewed from this perspective, for these are the silent custodians of an arcane knowledge, the product of a daily acquaintance of many hundreds of homes’ hidden voids. Were those professions more literary we might have legion of psychogeographically inclinded accounts of chasing pests, pipe and wire routes through these alien zones. We would be able to sit, read and marvel at the ingenuity and accumulated place-reading skills of those liminal technicians. We would hear tales of strange items, sensations, sounds and smells encountered in the deepest recesses of our homes. But sadly these technicians do not (to my knowledge at least) commit these thoughts to paper. There is a subculture out there, an underground movement, that I got caught up with a few years ago. This, in brief, is the story of my entrapment, and my eventual escape. Foolishly or otherwise (probably churlishly in my case) I didn’t keep my obsession secret. I mentioned it to those who (I thought) were interested, and quickly changed the subject whenever I realised that – actually – they weren’t. But, more often than not people seemed to ‘get it’. Their eyes would look skyward in reminiscence and a smile of recalled childhood play would briefly pass across their face. AFOLs have a way of describing the re-discovery of Lego in adulthood – they portray it as an emergence from an adult darkness, as an enlightenment. The adult life before Lego is portrayed as a personal dark age in which the joy of Lego had been forgotten, lost somewhere along the path to maturity. That moment of re-discovery, is an epiphany, a step forward into the light of a contented Lego-embrace. In my case, it was a combination of events that led me back to the joy of multi-coloured plastic building bricks. As I recall it now, looking back from a perspective that finds me (sort of) back in the darkness Lego-wise, the paths were first sown by my (then very young) kids being given small Lego sets as presents. Helping them to put these together reacquainted me with that distinctive combinatory urge that spills out whenever two or more Lego bricks are to hand. 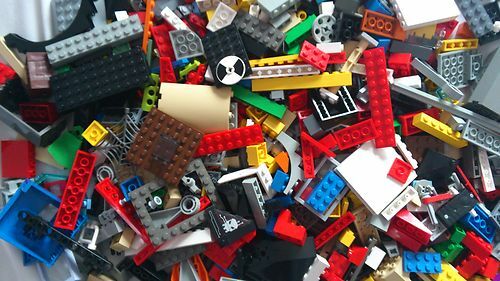 I just fall, even now post-rehab, into fidgeting with them, cycling through the available combinations, innately judging some creations as more successful than others (there is an aesthetics by which to judge even the most simple Lego assemblages). Then, a short while later my wife and I realised that our house was drowning in pieces of toys and related plastic tat strewn by our kids. What to do? So, we logged onto ebay and started looking for second hand Lego. That was the start of my fall headlong into endless nights of Lego hunting. A couple of kilo (yes, on ebay Lego can be bought in big amorphous piles) would have been sufficient for our needs, but this bright shiny world sucked me in, much to my wife’s increasing frustration. I scrutinized fuzzy pictures of Lego lots, trying to work out what sets might be included, fragmentised, within these heaps. I would look for rare shapes or colours sticking up out of the pile. In a spririt of ‘reverse engineering’ I could then use online resources to identify the part numbers of those pieces and, with online directories of Lego sets work out what riches these fragments might bode (each Lego piece and every set has unique serial numbers which facilitate this obsessive archaeology). I also got hooked on hunting particular set families – I had a Japanese book, Lego Museum 1, to guide me. It was written in Japanese, which meant I couldn’t actually read it – but the pictures, the dates, the serial numbers, countries of issue and the taxonomic curation of these sets into distinct genealogies gave me everything I needed. Suffice it to say that for a few years, my obsessive Lego hunting was problematic within our household. Yes, the kids enjoyed playing with it, but they preferred new Lego – they wanted to play with sets that they saw in the shops, sets that were themed around films they knew (a canny move by Lego in recent years). They didn’t need Lego by the kilo, and much of what arrived sat in boxes unused. But my thrill was in the pursuit – particularly getting a set for the fraction of the price that it would have cost when ‘new’. Often it would be possible to ‘win’ sets on ebay that had been played with (or perhaps never touched by) a child 25 years before. These would arrive (with another knowing look from the postman) at our house complete and with original packaging in pristine condition. Most ‘collectors’ at that point would make the model and then put it and the packaging safely to one side. But I found my biggest thrill was actually in (a few months later) smashing up the model and surrendering its pieces into this ever growing mound of homogenised Lego bricks. It was the sheer abundance of this plastic that thrilled me most. The attentive reader, will have noticed that I’ve said very little so far about actually building stuff with this Lego mountain. We did, and one summer I even painstakingly sorted (a fraction of) the Lego mountain by colour and shape, as a prelude to some planned factory-scale world building project. But it never happened, there was never enough time. Much like people buy books but never get around to reading them, it was the thrill of hunting and acquiring that drove me on. This for me was a warped accumulation drive, stuff for the sake of stuff. For this reason, I can’t claim to have ever fully joined the AFOL clan. Most of these people acquire their Lego in order to do something with it, and there are some amazing examples out there of Lego engineering and creativity. During one family conversation my wife suggested that I try adjusting my ‘hobby’ to virtual-hunting, something akin to ‘fantasy football’. She suggested that I could pretend to bid on items, that I could thereby render this pursuit an abstract one in which I was not actually spending money or bringing more plastic bricks into the house. It was a good suggestion, but didn’t feel right. Actual and virtual hunting aren’t the same. In particular, virtual-hunting offered me no ‘rush’ feeling either at the moment of a winning bid or the opening of a packet to find verification of my Lego archaeology skills. Looking back, I think this obsession just burnt itself out. Life was too busy, I was fed up with treading on Lego pieces and my well-worn attempts to justify my continued hunting weren’t even convincing me anymore. I started a new job and other distractions and channels of ferreting around opened up. Intellectually I can see the suitability of a virtual approach to such hunting, but I don’t think that would have worked out for me. Too much of my obsession was wrapped up in a desire to create a sheer accumulating of this stuff, this mountain of potentiality, a plastic monument to my hunting and research endeavours. But I have no regrets about this period. I learnt a lot (and not just about Lego serial numbers). First, my eyes were opened to the power of on-line enthusiast communities, the ability of fans to organise and circulate bodies of knowledge and practice in a mutually-supporting manner. This interest led me on into my studies of the on-line communities of practice of tree surgeons, urban explorers and bunkerologists (and yes, I know I will get flak for likening urbex people to Lego geeks). Thirdly, it got me thinking about the power and endurance of classification systems and specifically the way in which Lego is physically structured as a system. It is (and was designed to be) a system of infinite combination. That combinability is a function of the uniformity of the standard brick stud design incorporated in each piece. There is now an increasingly wide variety of pieces, but they all fit together because of this ‘inter-locking’ design rule adhered to by each piece. Fourthly, it made me aware of the power of emotional investment in toys – not only their interplay with childhood memories and absence or surfeit of toys, but also the way in which I became emotionally aligned to Lego as a brand. There are other, rival, plastic construction toy manufacturers – but they always felt like a heresy. I couldn’t bring myself to contaminate the systemic unity of my Lego mountain with Mega Bloks and other ’imitations’, even if functionally they readily could fit within it. Indeed, one of the things that (I think) helped wean me off my Lego obsession was the slight change to the plastic formulation a few years ago. Lego bricks simply don’t make quite the same noise now when rummaged, the lustre is duller and the surface texture feels different. All of this is feint and may well be imagined by me, a way of underpinning my aversion. Finally, and most importantly, re-discovering Lego helped me to realise how my generation grew up in a Lego-world, a world shaped by a move towards componentisation and interchangeability of parts. This trend appears in both the material word (e.g. containerisation of freight, international harmonisation of product standards and the rise of system building in construction) and also in the ‘intellectual’ one: for I think playing with Lego builds a particular way of thinking, it encourages manipulation of concepts and ideas as interchangeable parts that can be known, played with and assembled into an infinite array of interesting combinations. I could go on, but will leave it here for now, the adult world beckons. Maybe one day I will write more on this. In this short piece I’m going to look at the intense, tunnel-vision characteristic of moments of deep immersion in a hobby practice. I will touch on climbing and then spend longer on model railway world-building. I read an interesting essay yesterday by Krein (2010) connecting climbing to the Stoic concept of freedom. Krein persuasively argues that the ‘freedom’ that climbers claim to experience whilst confined on a mountainside within the deadly proposition of a sheer rocky terrain, is a ‘freedom’ that can only be understood in the sense known to the Stoics (ancient Greek philosophers). Invoking Chrysippus, Krein concludes “one may achieve freedom by climbing in accord with the mountain”(18). What he means is that to align yourself with the physical circumstances of the mountain – to ‘work with the grain’ rather than against it – will enable the climber to excel in his chosen endeavour. And that to excel in that field requires that the climber focus down into that fraction of the world. His or her survival depends on concentrating on the rock, inch by inch, and blocking out the (potentially fatal) distractions of the wider world. Thus the climber’s tunnel vision and total focus is essential. 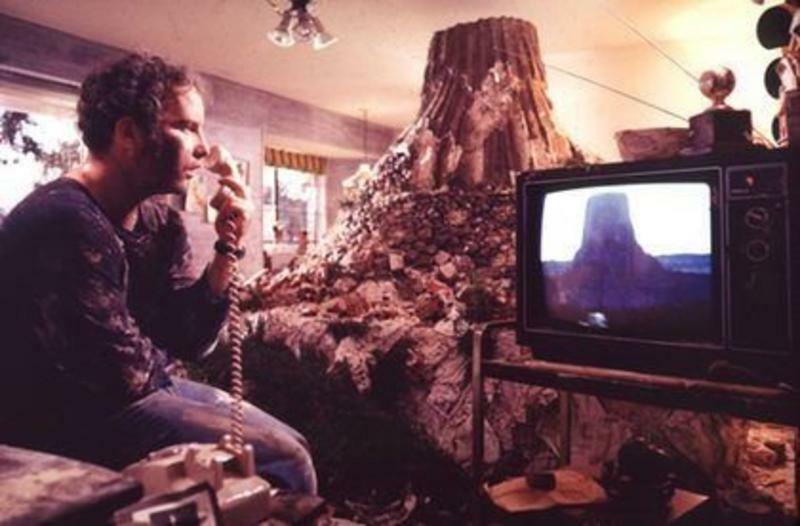 Dreyfuss’ character is building a mountain. But he’s not practising for an ascent. He’s a modeller, forced by extra terrestrial circumstances to physically enact the same flat-topped mountain in any available materials that will allow him to ‘work-out’ this compulsion. That brings me to model railways. Just over a year ago I spent an intense two months working through something similar. No UFOs were involved and the ‘moment’ passed, and I can now look back on it with detachment. But at the time it came close to similar dinner-table tensions over the tunnel-vision that had temporarily overcome me. It all started with one of my kids deciding to spend some Christmas money on a model train set. We trekked off to Argos and got one (half price in the sales). He quickly lost interest in it. A train going round in a circle was pretty dull. 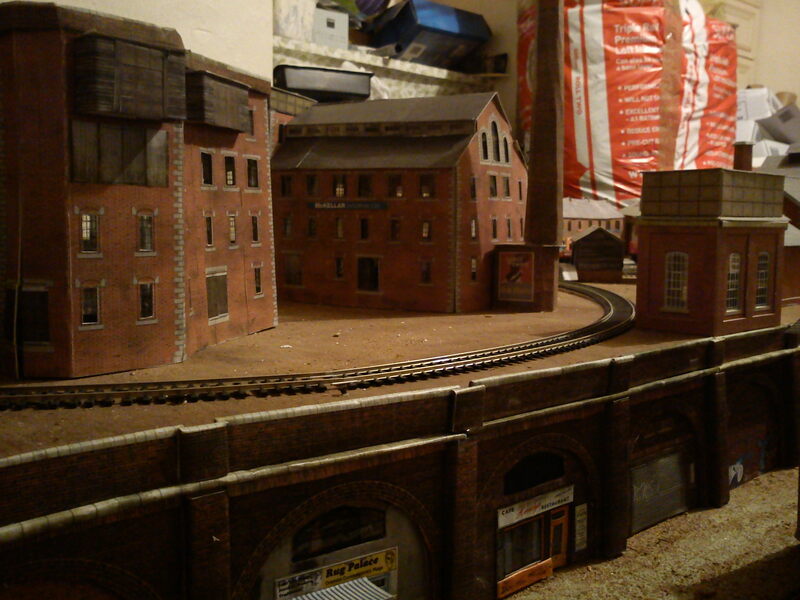 So, I thought we could enhance it by building a scene for it – and getting some more track. That was the point at which this tipped over into ‘Dad’s project’. The train set soon disappeared into the cellar, mounted on an ever-larger board and with an increasing elaborate track layout. I bought a couple more (fairly) cheap sale sets and became fixated on solving the challenge of how to fit together three identical oval tracks onto the same board footprint. The answer that eventually appeared to me late one evening was a system of ramps, tunnels and points. The challenge was like a jigsaw – to find a way of using every (mostly curved) piece. But one I’d solved that infrastructural problem there was still little joy in actually running trains on the network. So, I figured it must be because the layout needed land forming and the addition of buildings and scenery to make it a ‘proper’ world. And that’s when I got really lost. I discovered a sub-cultural world of cardboard and print-your-own buildings. The trains and their tracks became a distant memory as I spent every spare (and many not-spare) moments frantically building a fragment of an industrial town: mills, breweries, workers terraces, docks, canal, LPG storage etc. All my latent industrial archaeology and urban exploration urges became channelled into building my own gritty (and slightly grotty) world. 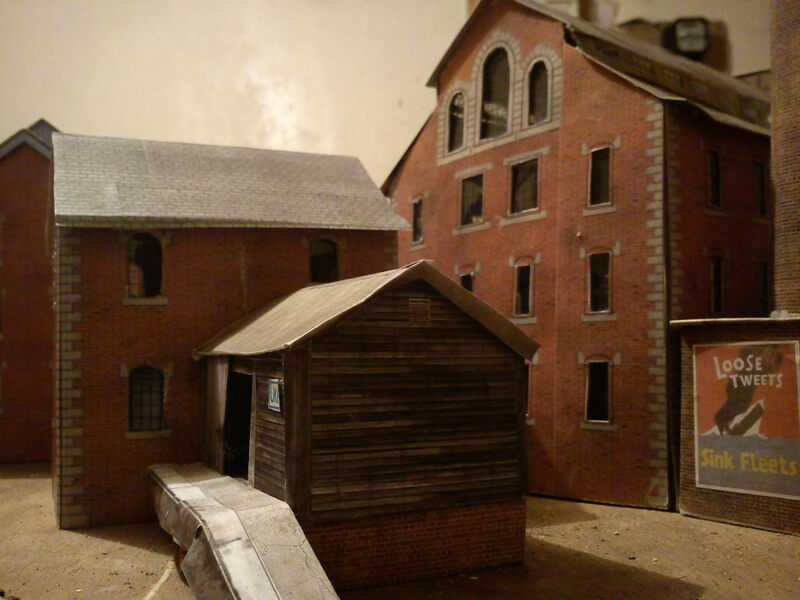 I found that armed with my scanner and colour printer I could scratch build my own grimy industrial mill creations. 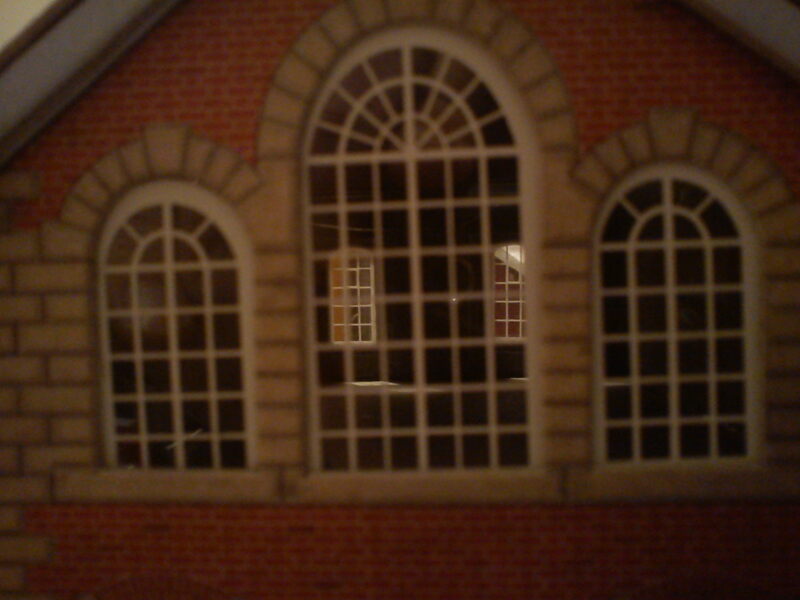 There is a focus within the railway model building fraternity on the authenticity of dirt, and signs of use-over-time. Nothing should look pristine. Items should be scuffed, in order to look ‘real’. Model paints bear this out in their names: ‘rust’, ‘dirty black’, ‘engineer’s grey’, ‘coach roof off white’. And model shops sell packets of dirt to sprinkle liberally upon these worlds (I preferred cutting out the middle man and applied real dirt: sawdust, sand, earth, ashes). There are also weird warpings of scale. Twigs become trees, moss clumps become bushes, rocks become mountains. Again, these materials can be bought at considerable expense. I just raided my garden. From the world I made a smaller world. Bachelard characterises the miniature world as one which is capable of being dominated by the maker’s command or viewer’s gaze, as distinct from the big, complex messy ‘real’ world of daily life. Here we can link to Michel de Certeau’s (1984) conceptualisation of the two perceptual levels at which a city may be known. De Certeau opens his essay, ‘Walking in the city’ with the vision of a spectator “seeing Manhatten from the 110th floor of the World Trade Centre…its agitation is momentarily arrested by vision. The gigantic mass is immobilized before the eyes. It is transformed into texturology…” (91). At this height, a degree of abstraction kicks in which filters out the infinite complexity of that world as formed, lived and perceived at street level. Puff draws a distinction between semi-abstract city models of the master planner and dioramas: models composed as three dimensional scenes, which may well feature human figures and aim to narrate stories of social interaction. Railway world models, at their best, can achieve diorama status and portray a social world (albeit a selected, frozen, static one). Looking at the elaborate railway model worlds that have been created by true aficionados via a near lifetime’s effort we can see all kinds of signification (of the maker-god’s direction). A completed railway scene is likely to be saturated in nostalgia, a yearning for a previous age – the ‘glorious’ age of steam and coal, or (in the apparent styling of younger protagonists), a gritty end-of-modernism, 1980s tired, greying urbanism. 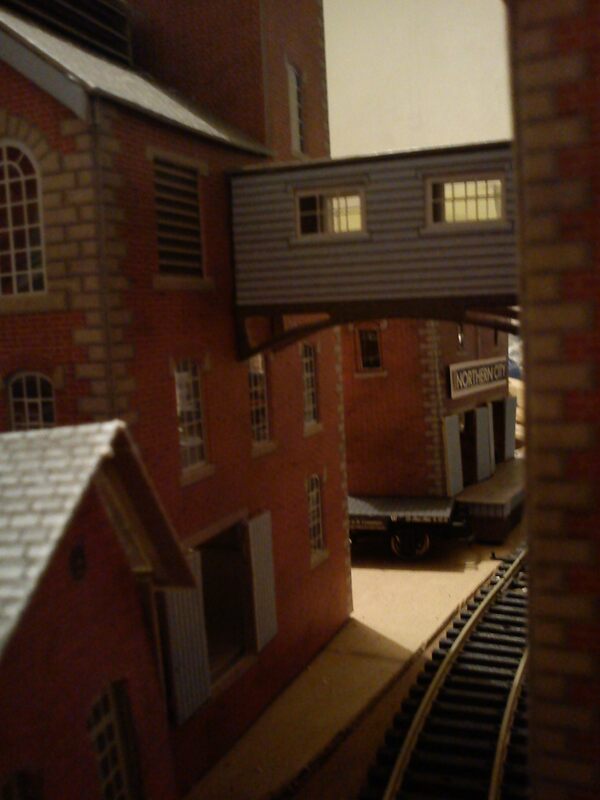 By comparison there are few modellers building truly contemporary depictions of railway worlds. In short, each railway scene maker’s composition will shout out their take on the world. Krein, K. (2010) ‘Climbing and the Stoic conception of freedom’ in Schmid, S.E. (ed) Climbing: philosophy for everyone, Wiley-Blackwell: Chichester.